Attention Cat Lovers! This Is Weekend Cat Blogging #39! See fun feline photos & discover yummy new food blogs. Visit my pal Clare & her dashing cat Kiri at Eat Stuff in Australia for all the links to this week's kitties. We'd love to have you join us. Just leave your permalink in a comment at Eat Stuff. For even more pussycat pics, be sure to catch the traveling Carnival Of The Cats each Sunday night. And the weekly Friday Ark features everything from cats to condors. I love that little black spot on Patchy Cat's nose!! I had a cat that looked like him, right down to the same spot. Great cat photo! Such a handsome boy. Patchy Cat is a very special looking kitty! Thanks. He really is a cutie. And very photogenic. He's an all-around special kitty. We are so fortunate to have him here. Can you believe somebody didn't want him anymore and gave him to Joe? Crazy! But obviously he was meant to be here, running the farm and keeping us all in line, LOL. He is one tough supervisor! 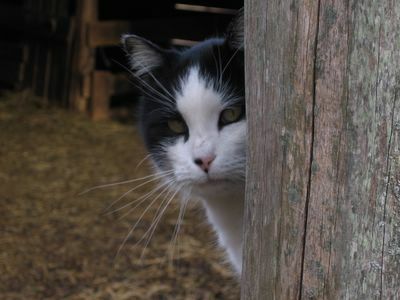 He sleeps each night down in the barn and so he can keep an eye on the girls. That;s a mighty fine looking cat. I love the eyeliner! For some reason, it made sme think of David Bowie. Patchy Cat is so adorable and lucky as he got adopted by you. I can imagine him being THE boss in the farm.